Autumn is such a great season here in West Michigan. You can visit a multitude of festivals, take a fall color tour to view the spectacular oranges, reds and yellows that take over the landscape, and just enjoy the cool, crisp air. Halloween is not just for kids....our local communities sponsor various parties and events that are fun for the entire family. For more information on Trick or Treat dates and locations, read our Halloween story. 4180 W. M-20, New Era. (231) 861-5730. Corn Maze opens in early September with other fall activities in full swing by mid-September. Featuring The Apple Express, Barrel Train, Pumpkin Moon Walk, jumping pillow, and pedal carts. U-pick apples and pumpkins for additional charge. Special music is performed some weekends. Visit LewisFarmMarket.com for more information. 8400 N. US 31, Free Soil. (231) 464-5534. 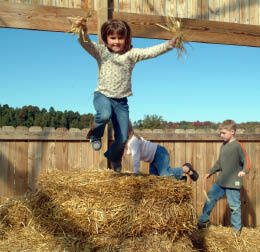 Wagon rides, corn maze, u-pick pumpkin patch, games, wagon rides, apple cannons, and more. 11am-5pm Saturdays and Sundays beginning in September and going through the end of October. Visit OrchardMarket.us for more information. 1395 Lakeshore Rd., Manistee. (231)794-9150. Corn maze, outdoor family fun games, and farm animals. 11am-6pm Saturdays and Sundays through October. Admission fee: $5 per person (children 3 and under are free). at Lakeside Links Golf Course- 5369 W. Chauvez Rd. in Ludington. Benefits the Second Chance Humane Society. Chili is served on the course along with two kegs of beer. Top two-tier payback, a blind auction, and more. at Medilodge of Ludington- 1000 E. Tinkham Ave. Bring your pets dressed in costume. Costume contest and lots of prizes. at the Historic White Pine Village- 1687 S. Lakeshore Drive in Ludington. at the Ludington United Methodist Church Pavilion - 5810 Bryant Rd. Pumpkin painting, cider press, s'mores, hot dogs, hay rides, bounce house, and more. at Mason County Reformed Church- 45 S. Amber Rd. in Ludington. Admission is free and open to the public. Saturday from 6:30-8pm: free live music and chili cookoff. Sunday from 12:30-2:30pm- Pig Roast, games, ponies, bounce houses, and much more for the whole family! at the Ludington State Park. The event includes a horse-drawn wagon ride, doughnut holes, apple juice, music by 80 Cows, a beach campfire and the beautiful views at the Lake Michigan Beach House. The event is sponsored by Friends of Ludington State Park in conjunction with Ludington State Park and Soberalski Farm’s Draft Horses of Pere Marquette Township. Live music and refreshments served. 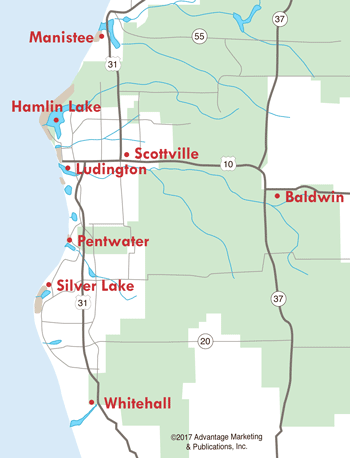 There is no cost but donations to and membership with the Friends of the Ludington State Park are encouraged. at the Ludington branch of the Mason County District Library- 217 E. Ludington Ave. Crafts, games, a slightly spooky story, and other activities. Costumes are welcome! Children under age 8 must be accompanied by an adult. at Tractor Supply Company- 4572 W. US 10 in Ludington hosted by Mason County Animal Advocates. Photographer will take photos of pets in or out of costume and there will be Halloween wreaths for sale and Halloween mugs with treats for visitors and their pets. Free-will donations are encouraged to help Mason County dogs and cats in need. - 1687 N. Lakeshore Dr. in Ludington. at Cartier Park- 1254 N. Lakeshore Dr. in Ludington. Hosted by Connexion Point. beginning at the Cartier Park Gazebo- 1254 N. Lakeshore Dr. in Ludington. The race is open to students in grades K-6 (excluding current 6th graders on the cross country team). Awards will be given for the top 5 finishers in each grade level, boys and girls. Ribbons, juice and snacks will be given to all participants. Registration is $1/runner. at the Scottville branch of the Mason County District Library- 204 E. State St. Pumpkin-flavored everything, games, crafts, and all kinds of fun. Children under age 6 must be accompanied by an adult. - 320 S. Madison Ave. in Custer. Haunted maze, family friendly, and free for all. at SandBar- 203 S. James St. in Ludington. Food available for purchase and shot specials available! 1st and 2nd place Costume Contest at 11pm. at the Historic White Pine Village- 1687 S. Lakeshore Dr. in Ludington. A delightful evening of scary goodwill in the spirit of fun and fright for adults. - 304 E. Ludington Ave. in Ludington, Halloween Costume Parade at 2pm. Both sponsored by Safe Harbor Credit Union. presented by Boy Scout Troop 1190 at the Community Church- 109 N. Harrison St. in Ludington. Lights on, if requested. All donations go to funding activities for the troop. at the Ludington branch of the Mason County District Library- 217 E. Ludington Ave. in Ludington. Event includes crafts and games. Free and open to the public. Children under age 8 must be accompanied by an adult. at the Ludington Area Center for the Arts- 107 S. Harrison St, Ludington. for teens and adults. Night-time bicycle ride, which makes its way around town for about 5 miles. Prizes will be awarded for the best costumes, and others will be raffled, to those who are brave enough to ride. Expect surprises. at the Sherman Oaks Apartments Community Room- 700 Sherman Oaks Drive in Ludington. There will be a costume contest, food and hot cider, music, games and more. All ages are welcome. at Photography by Sue Brown- 1676 W. Hansen Road, Scottville. Free photo with donation to United Way of Mason County. at Cornerstone Baptist Church- 121 Nelson Rd. in Ludington. Event includes face painting, inflatables, games, a photo booth, prizes and candy! at The Hof Bar & Grille- 3220 E. Free Soil Rd. in Free Soil. Costume contest with multiple categories. at Lewis Farm Market- 4180 W. M-20 in New Era. at 7970 W. Park Rd. in New Era. Corn maze and zombie shooting gallery. Four attractions: Field of Screams, Zombieland, Corn Maze Craze, and Zombie Paintball. $20 to enter. Fresh cider, food, and merchandise available for purchase. Children under 14 must be accompanied by an adult. Free parking. at 265 E. Tyler Rd. in Hart. Three attractions for $10: the Carnival Tunnel, The Maze of Dr Morell and The SHEDD. in Downtown Pentwater. Story time at Storybook Village, Costume contest, face painting, pumpkin painting, sack race, great pumpkin roll, candy bags, Trick-or-Treating to downtown merchants, Spooktacular Parade, and Pub Crawl. at the Shelby Optimist Club- 788 Industrial Park Dr. in Shelby. A night of dancing, food, drinks, and fun! at Murphy's Tavern- 8848 80th Ave. in Pentwater. Featuring live music and costume contest with cash prize for best costume. on the S.S. City of Milwaukee historic carferry. This is a truly thrilling and scary adventure. Travel through five decks and 72 stairs, some quite steep. For more information, visit Carferry.com or call (231) 723-3587. Located at 99 Arthur Street (US 31). at Onekama Village Park. Craft and food vendors, inflatable castle, wagon/pony/miniature train rides, face painting, Mr. Balloon Man, Corn Hole Tournament, Live entertainment, and more! Rain location: Onekama School. Visit onekama.info for more information. at the Manistee Elks Club- 432 River St.. Events all day for all ages.